In a previous post I described the overall design and architecture of Capital Match’s core system. I now turn to providing more details on our development and operations environment which uses mostly Haskell tools and code. As there are quite a lot of moving parts, this large topic will be covered in two posts: The present one will focus on basic principles, build tools and development environment ; it shall be followed by another post on configuration management, deployment and monitoring. I consider both development and production environments as a single integrated system as, obviously, there is a porous membrane between the two especially in a small company with 4 developers. Although I have been interested in that topic since my first systems programming course in university, some 18 years ago, I do not consider myself a genuine systems administrator and I made a lot of mistakes while building Capital Match platform. But I do believe in the “you build it, you run it” motto and this is all the more true for a small startup team. Hence I have tried to pay attention to building a flexible yet robust system. Use as much Haskell as possible. Provide some level of reuse across containers and components thanks to layered FS. 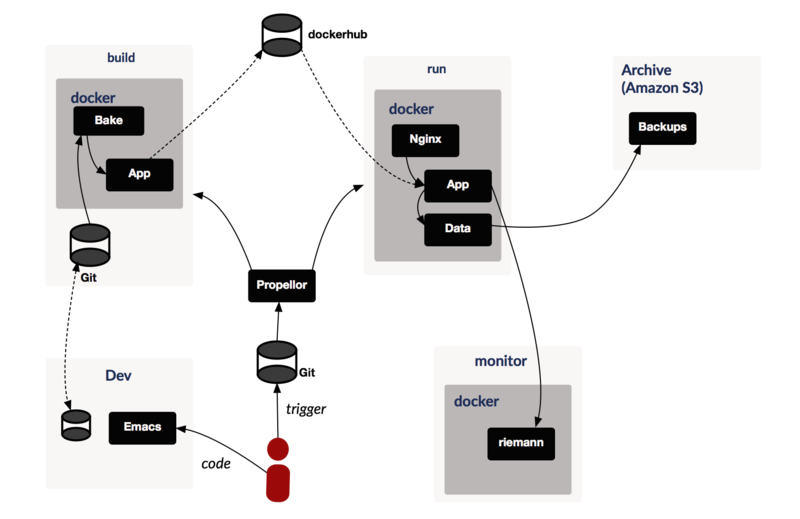 Note that we stuck to the initial docker “philosophy” of one process per container, except for some very specific needs (e.g. Selenium testing): It is not possible to ssh into our applicative containers. In practice this is quite a bit more complicated as there are some glue parts missing to ensure the whole system can be rebuilt from scratch, but still we came quite close to that ideal. We are using 2 different repositories, one for the application code and one for the environment, mostly for technical reasons related to how our configuration management software works. The only unversioned part is the description of the “hardware” and the provisioning part which is still done “manually”. There is not a dearth of tools when it comes to configuration management, systems provisioning and deployment, build tools… When starting small you usually don’t want to invest a lot of time in learning new tools hence a common choice is simply to start small with shell scripts. But tools usually exist for a reason: Scripts quickly become a tangled maze of scattered knowledge. Yet we have at our disposal a powerful tool: Haskell itself, the language and its ecosystem, hence we decided to try as much as possible to stick to using Haskell-based tools. Beside the obvious simplification this brings us (one compiler, one toolchain, one language…), the advantages Haskell provides over other languages (type safety, lazy evaluation, immutable data structures) seemed to be equally valuable at the applicative level than at the system level. Various components of the system feed events to riemann monitoring system. stack represented a huge improvement for managing our build but it took us a few months to ensure it built consistently. The biggest hurdle we had to overcome to make stack work for us were the tests. Some tests relied on specific files to be present which means we had to manage relative paths: depending on whether or not tests are run from toplevel (which is the case in CI for example) or from local package directory (which is the case when using stack to build a tree of packages), relative directory may not be correctly set. Moreover stack runs tests in parallel, which is a good thing to force you to implement parallelizable tests but failed for us as we relied on starting server on some port for integration tests. We should get rid of hardwired port and allow the server to use some randomly allocated one but we chosed the simplest path and configured stack to run tests sequentially. A minor annoyance is (was?) that stack maintains a build directory in each sub package, even when run from the toplevel, which is not the case when using cabal sandbox. This implies that reusing previous builds is a bit more cumbersome as one needs to save each .stack-work directory. leiningen is (was?) the prominent build tool for clojure and clojurescript. We chose Clojurescript for the UI mostly because this allowed us to develop it using the excellent Om wrapper over React. It took us quite a lot of time to get our project build comfortable and it did not evolve as quickly as the Haskell one. The CSS part of the UI is written using garden, which means we have to compile it to proper CSS then pack and compress all CSS files together to improve load time. In retrospect, this was probably a mistake: We don’t use clojure’s power to write our CSS and it is still a mess, so we would have been better off using some standard CSS language like Less or Sass (although this adds the burden of running some thirdparty tool as part of the build…). There is a single top-level script which builds everything and is ran from the container. Given the diversity of tools and components we are building, we needed a way to orchestrate build of the full solution which could be easily run as part of Continuous integration. We settled on shake which is a Haskell-based tool similar to make. Shake build also contains rules to run different class of tests: Unit/integration server-side tests, UI tests and end-to-end-tests (see below), and rules to clean build artifacts and docker containers. There has been various attempts at providing an IDE for Haskell: * leksah is an Eclipse-based Haskell IDE, * Haskell for Mac, * FPComplete used to provide some web-based environment. Having used emacs for years, I feel comfortable with and besides there are actually benefits using a plain-text tool for coding when you are part of a distributed team: It allows you to easily setup a distributed pairing environment with minimal latency. Yet configuring a proper Haskell development environment in Emacs can be a challenging task, and it seems this is a moving target. Starting from Haskell-mode page is good idea as it is the base upon which one builds her own Emacs Haskell experience. Some people at Capital Match have started to use spacemacs which seems to come with a correctly configured Haskell environment out of the box. When all unit tests pass, commit and push to CI. The nice thing when using non-modern languages like Haskell and Clojure is that you only need to be able to edit text files to develop software, hence the choice of Emacs to develop both is kind of obvious. There is very good support for Clojure in emacs through nrepl and Cider but it seems having the same level of support for Clojurescript is still challenging. I already discussed in a previous blog post how we managed to do pair programming with a distributed team. One of the virtual machines we configured was our devbox which we used to do remote pairing and run experiments. We also pushed emacs configuration to a shared git repository which is pulled when configuring the machine, something we should have done earlier of course. Even if tests are run in parallel, this means it takes more than 10 minutes to get to the point where we can deploy code. Actually, CI tells us our mean time to deployable is about 30 minutes, which is clearly an issue we need to tackle. To reduce build time there is no better way than splitting the system into smaller chunks, something the team has been working on for a few months now and is paying off at least by ensuring we can add feature without increasing build time! The next step would be to split the core application which currently contains more than 80 files into more services and components. Using containers also makes onboarding of new developers somewhat easier: They can focus on a single part of the system (e.g. UI) and rely on the containers to run a consistent environment locally. The single feature I miss from my former Java development environment is refactoring: The ability to safely rename, move, extract code fragments with a couple key strokes across the whole code base lowers the practical and psychological barrier to improve your code now. GHC (esp. with -Wall -Werror flags on) catches of course a whole lot more errors than Javac or gcc but the process of fixing compiler errors after some refactoring of a deeply nested core function is time consuming. On the other hand the lack of global refactoring capabilities is a strong incentive to modularize and encapsulate your code in small packages which can be compiled and even deployed independently.